No, these cats don’t have dandruff. They’re covered – make that, sprinkled – with snow, and I’m posting their picture to show how much of the white stuff fell here a couple of weeks ago. While the rest of the country hunkered down against blizzards, ice storms and every other kind of weather hazard, here in the metro Atlanta area, I took a deep breath, blew the snowflakes off the porch railing, and went about my day. I’d love to see some snow. I’d like to see fluffy little snow-caps on the rose hips, icicles decorating the bird bath, and a soft blanket of sparkling crystals on the lawn. But the last time I admitted to this romantic-minded foolishness on social media, I got blasted by people who hoped I’d get stuck in my car for a day and a night, with nothing but a half-can of flat Coca Cola and a package of spearmint gum to live on until I was rescued, or the sun came out. They wished me the joy of shoveling to get to the mailbox, only to find that the mail never came, and tunneling through streets piled high with mounds of dirty, freezing slush. Not what I meant, but never mind. I get it. Since it’s February, and once again, a few flakes are falling to the north, but not here, I’m turning my thoughts to other things. I’m excited about writing for the Travel Channel blog, which re-launches in March. I’ve covered gardening for years, and I’ll always have dirt under my nails (so to speak), but I’m looking forward to blogging about new topics, like where to find the best oysters or schools that teach you to hang glide. I’ll give tips about where to go on spring break and how travelers can learn to sculpt or play the banjo while on vacation. This variety reminds me of an aptitude test I took in college. My results said I’d make a great nurse, missionary or librarian (clearly, I had a strong do-gooder streak, as well as an instinct to keep books neatly shelved). But I didn’t skew strongly in any one area. My test also said I’d do well as a scientist (apparently it didn’t measure math skills), teacher, farmer, dancer (seriously? the desire to do a thing does not equal the ability to do it), vet, decorator, designer and artist (if only I could paint). At first, this Jill-of-all-trades assessment worried me, until I realized that it simply meant that I was curious about a lot of things. That turned out to be a useful quality for a writer. When you get to explore many different subjects, your work is never boring. I’ve partnered with the captain of a nuclear sub while canning spiced peaches at a cooking school; snorkeled with manatees; and gotten caught in a volcanic eruption (Alaska’s Mount Spurr, years ago, and it was cold ash, not lava, or I wouldn’t be here now). I learned to fly-fish in Montana, on the same river as the one in Robert Redford’s film, A River Runs Through It (sadly, he was long gone). I’ve backpacked with llamas in Taos, traded heirloom seeds with gardeners from around the South, and climbed into the wheelhouse of a riverboat to watch the dark waters of the Mississippi roll by as the moon rose. Of course, not all assignments are exciting or fun. I’ve also written about the differences between fluorescent and metal halide lights, the advantages of fertilizing with pellets packed with micronutrients, and more. Now I plan to blog more regularly. I want to share info from the travel blog, once the posts go live, and since I’m learning to quilt and sew, I’ll also write about some of my projects. I’ll probably ask for help from folks who know what they’re doing, because I’m teaching myself, and I need it. And there are books, of course….books I’ll read and review, and a book for middle grade kids that I’m writing. I’ll share my progress–or lack thereof–as time goes on. Kind of a mixed bag, isn’t it? Travel, quilts, books, and my rescue pups, who wind up in my posts and stories from time to time. That’s okay. 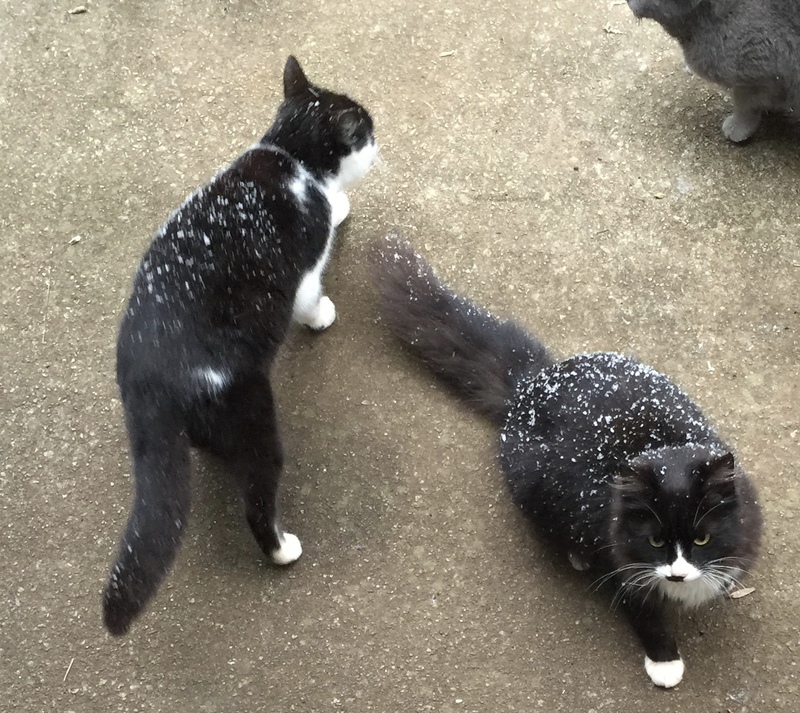 Sometimes you start with snow cats, and go on to other thoughts. Now I see why so many people get hooked on quilting. It’s all those fantastic fabrics, with their beautiful colors and designs. 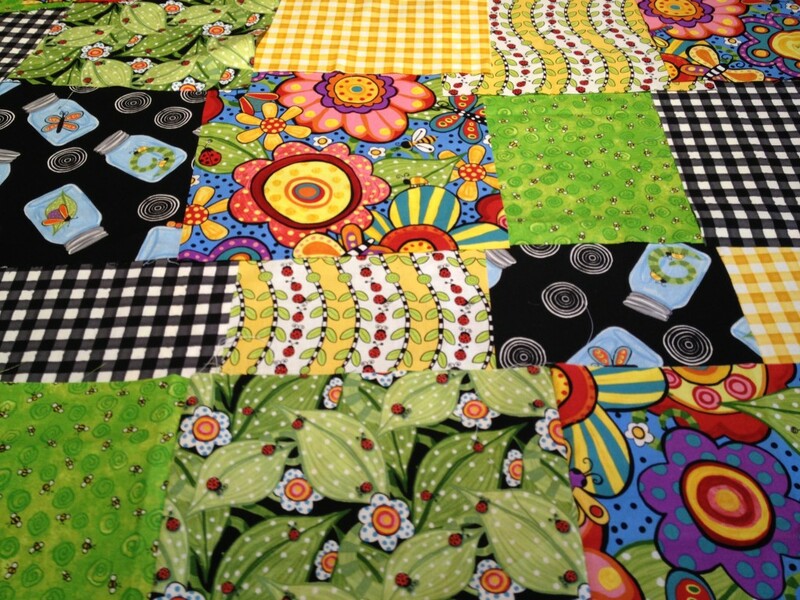 Right now, I’m working on a picnic blanket quilt that uses the Bugapalooza fabrics designed by Jennifer Jangles. I may back it with a waterproof material, since this will be used on the ground, or maybe a heavy twill or canvas, as Jennifer (whose real name is Jennier Heynen) suggests. You can find her instructions for making your own picnic blanket here. After putting words together all day for the middle grade novel I’m writing, Whistling for Elephants, piecing a few cloth squares is a welcome break. My eyes are hungry for colors beyond the black and white of the printed page, and for patterns that aren’t just blocks of text on a computer screen. But even while I’m quilting, my brain is churning with plot ideas, and I’m trying to think up new descriptions and snappy dialogue to make my characters come alive. Writing for children isn’t easy. You’ve got to remember what it’s like to play and forget the distractions of being a grown-up. This week, my distractions have included paying for a new car transmission, learning to cook for someone on a very restricted diet, cleaning the house, walking the dogs (who shed so much in the summertime heat, they double my housework), and–well, you get the idea. A few weeks ago, my agent asked me to write a new outline for my book, to help me double its length and dive deeper into the story, and I’ve just finished it. Now I’m waiting for his comments before I start writing again. This agent has a strong editorial background, and I’m grateful for his guidance. To be honest, I wish the writing work was done, but there’s more ahead before my manuscript is ready to submit to publishers. Sometimes I get discouraged, because I’ve worked on this book for so long. In some ways, writing is like making a quilt. You make a block for your quilt; you scribble a paragraph for your book. Next you join the blocks into rows, and the paragraphs into chapters. Eventually, you stand back and look at what you’ve got and decide whether you need to add more here or take away something there. When you finally see the pattern you’re aiming for, and it pleases your eye and heart, you know your work is finished.